You can now download the latest free PES Club Manager Apk + Mod + Data + OBB here in Techbmc. The Popular Pro Evolution Soccer Club manager, offers you a nice feature to control and customize your team while leading them to winning matches. As a football fan, that loves playing sports games, I always go for games with good graphics, games that provide an option for creating my choice of dream team, and access to so many other features. To have it, PES club manager apk hack, does such. So I thought of sharing it with you guys. The game is featuring more than 5,000 licensed soccer players and Sophisticated 3D matches. Pes club manager gives you options to train, select your choice of players, build your own team club house. You can train a player to have one special skill which will be employed when leading your team to be the world best football manager. You have a lot to enjoy in this android game. => Has real-time match simulation which manages user style when controlling and implementing tactics to your created team in real time. The feature is awesome, as it tends to get you being the controller of the game, to be committed in pushing your players to scoring goals. 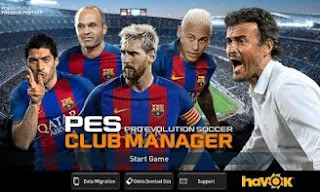 =>The pes club manager also comes in beta apk, which offers a better features too. But, talking about this particular one am sharing the free download link, it features 3D Matches and is Powered by the PES Console Game Engine. That is to say, PES CLUB MANAGER is developed with an optimized version of the game engine from console video game, Pro Evolution Soccer 2015. So having the feature of Realistic 3D matches in the game and also real-time stats, leading your team at top becomes easy. 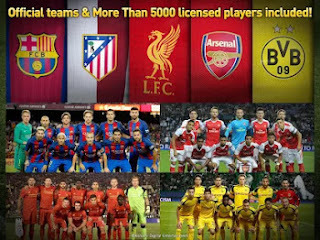 => The game came with over 5,000 + Officially Licensed Real Players that can be seen around the globe, as well as official licenses for real leagues and clubs. Most of the popular club from European and South American countries are as well very active in the game. When you must have mastered your tactics and skills, you can face some of this popularly European Giants with skilled players in order to test your performance. Some of them are as follows; Chelsea, Manchester United, Bayern Munich, Paris Saint-Germain, Barcelona etc. => Change weak and tired players when playing any match with your opponents. You can as well bench any player as the team manager. The game has advantages and disadvantages, read on to see them. Download And Install Pes 2017 ISO With PPSSPP Emulator For Android Apk. Download PES 2017 Apk + Data OBB for Android OS. Download Football Manager Mobile 2017 - FMM17 For Android APK+MOD+OBB Data. The game is a free-to-play football game app. Since it is free, no purchases are required. All can play the game for free, but purchasing the unlimited PES Coin, helps in speeding up the gameplay. If you want to enjoy the game with cheat, then stay tunned because am gonna publish that soon. Meanwhile, In-app purchases can be disabled by “limiting in-app billing” on the device used. order for you to play and enjoy the game. There is no compensation for users that downloaded and try to play it on a non-supported device. Supported Devices:Phones with Android OS version from 4.2.0 and above. Download PES Club Manager Apk For Android HERE. That's all, tell us your experience while playing the game. Don't forget to share. Thank you.